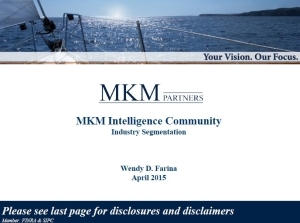 Wendy D. Farina joined MKM Partners in April 2008 as Chief Strategist, Equity Intelligence. 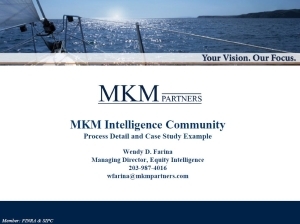 Prior to joining MKM, Ms. Farina led all consumer research and trend analyses at Vardon Capital Management, a long/short equity hedge fund located in New York. Before making the transition to the financial world, Ms. Farina was a successful business strategist and spent over 20 years consulting to Fortune 500 companies in industries as wide ranging as retail, apparel, food and beverage, restaurants, consumer electronics, airlines, hotels, real estate, technology, telecommunications, etc. Most recently, Ms. Farina was a Principal with Kurt Salmon Associates, a global strategy boutique widely respected by C-level executives across the entire retail and consumer business landscape. Ms. Farina graduated with honors from City University of New York/Baruch College where she earned her MBA from New York University with a Post Masters degree in Accounting. She received her B.S. in business from The University of Arizona. Jane joined MKM Partners in April 2014 as a Research Associate in the MKM Quantitative Survey Group. Jane brings 10 years of market research experience to the MKM Quantitative Survey Group including project management and development, survey design, programming, field monitoring and data analysis. Prior to joining MKM Partners, Jane was a Project Manager for MarketTools, Inc. where she managed multiple online market research projects simultaneously. 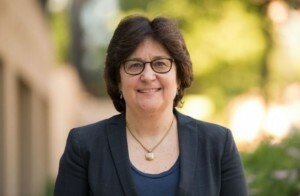 Prior to that, Jane served as Project Director for Perception Research Services where she oversaw multiple consumer goods packaging research projects, in both domestic and international markets. Jane received a B.A. in Psychology from Rutgers. Cheryl DeGroat joined MKM Partners in November 2011. In October of 2017, Ms. DeGroat transitioned her sales role to focus exclusively on MKM Quantitative Survey Group | QSG. Prior to this role, she served as a Senior Institutional Equity Research Salesperson in MKM’s Stamford office. 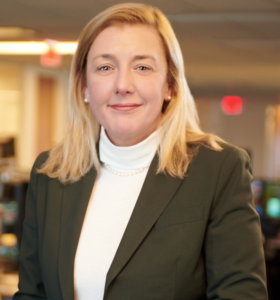 Ms. DeGroat has also held positions at Guidepoint Global Group (2008-2011) and also at Morgan Stanley & Co. (1993-2007). She holds a B.A. in Political Science from Fordham University. MKM Quantitative Survey Group is an alternative research pIatform that enables us to design and deliver high quality customized/proprietary research for our clients. Our studies are designed to specifically answer critical strategic and tactical questions about current consumer sentiment as well as behavior/near term spending intentions. Wendy D. Farina leads all of our custom research at MKM Partners and has over 20 years of experience consulting to consumer brands and companies across many industries and sectors. Part of her platform includes a private panel of more than 70,000 end-consumers across the U.S. that enables us to conduct this research at significant cost and speed advantage for our clients. Study results are exclusive and confidentially shared with clients who commission the work. We have other examples across many sectors including all of retail, food, beverage, beer/liquor, staples/household products, consumer technology, wireless/telecom, media/internet, hotels, auto, real estate, macro trends, new products, etc. We are also able to conduct international research studies and have been doing more international work lately. We have recently expanded our reach and custom research capabilities into the Healthcare sector by partnering with WebMD/Medscape. This partnership will provide us access to an additional 600,000 qualified, objective and fully anonymous physicians and over one million additional healthcare professionals, including nurses, physician assistants, pharmacists and hospital administrators. Please contact us if you want to learn more about the types of custom, proprietary studies we can conduct on healthcare equipment/supplies, healthcare services/facilities, managed care, pharmaceuticals and biotechnology. Flexibility – The ability to design (and scale) customized data inquiries via specific consumer targets/attributes allows the investor to achieve very specific research objectives. Proprietary Information – The proprietary nature of the information, in addition to the depth, breadth and quantitative significance provides clients with an edge in gaining access to insights ahead of the market. Efficiency – The cost and the speed of such access is unmatched. In some cases, the information can be gathered in as few as 48 hours and is extremely cost effective. In most cases, quantitatively significant research studies can be planned, designed, deployed, analyzed and finalized within one week. Confirmation of Study Objectives & Survey Design – Prior to collecting information, confirmation of the detailed plan and specific survey questions will be presented to the client for final review, comments and sign-off. Detailed/Final Analysis – A detailed final analysis will be compiled and presented to the client in report form. The analysis will include an interpretation of the results based on the original investment thesis/study objectives. Communications with Clients – Client briefs, reports and papers are distributed via email, fax, and ground mail. Client inquiries are answered by phone or email, depending on the preference of the client. Ms. Farina is available to do conference calls, speaking engagements and meetings upon request. 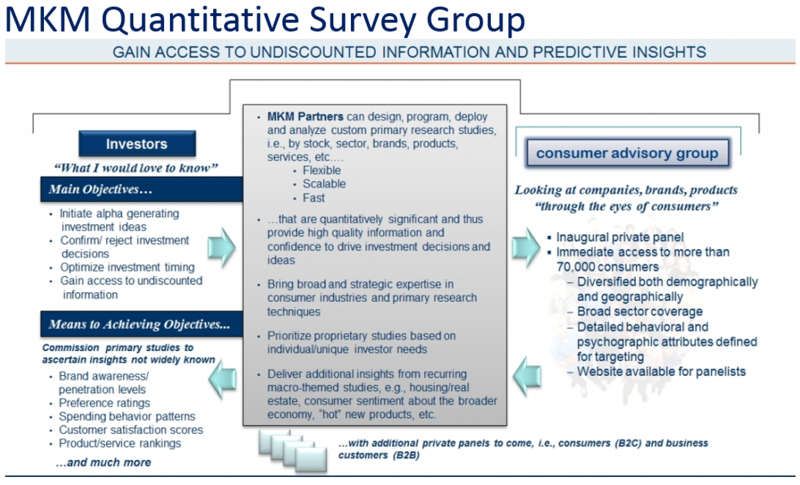 With so many consultants selling so many different services that are all around the mark, the insights of the MKM Quantitative Survey Group are targeted, customized, timely and answer my specific questions about a product. It’s a breath of fresh air. Ona joined MKM Partners in January 2017 as an Executive Director for the MKM Quantitative Survey Group. 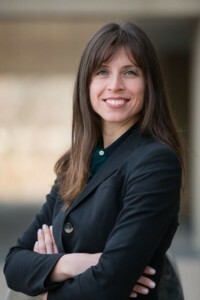 Ona was formerly the Senior Benchmarking Manager/ Benchmarking Analyst for SiriusDecisions (2010-2016) and an International Business Analyst for Parfums de Coeur Ltd. (2008-2010). 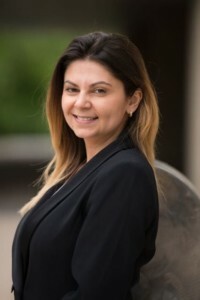 She received her MBA in Finance and Quantitative Finance from NYU Stern School of Business and her Bachelor of Arts in Business Administration from the American University in Bulgaria. David joined MKM Partners in June 2016. He is specifically focused on marketing MKM’s survey platform in order to accelerate expansion into private equity, corporate and other institutional accounts. 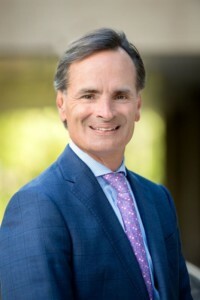 David draws on more than twenty years of experience in asset management institutional sales in various sales and leadership roles representing multiple asset classes and products for large global firms including Fidelity and over 13 years at MFS, as well as small investment boutiques. He received his Bachelor of Science from the University of Vermont in Business Administration and Political Science. He resides in Wellesley, Massachusetts with his wife and three children. For more information regarding the MKM Quantitative Survey Group please contact David Picher, Managing Director — Sales at (203) 355-3442.